A total of 180 persons attended the function (95 male, 55 female and 30 children). If you compare SAEEA previous Reunions, this time too, the number of attendees was very encouraging. Three new Members joined. They are (1) Syed Khalid Hussain from USA, currently on a visit; became member (2) Naiyer Nawaid Hashmi and (3) Mohammed Neyaz Khan. The location of Arena Club is in the heart of the City; so it was easy for every Member reaching the destination. The reunion timings suit most of the Members. There is large number of games within the Club; so it is a big attraction for the children. It was SAEEA 3nd function at the same Club. Lucky Draw gifts had also attractions for attendees. The event started with the recitation from the Holy Qur’an by SAEEA Vice President Engineer Iqbal A. Khan; followed by NAAT by Engineer Syed Waqar Fakhri. 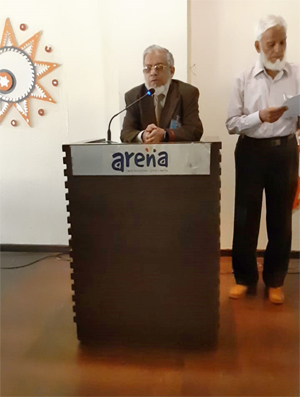 In his speech, Kamal A. Farooqui, President, updated attendees about the SAEEA activities held In-between 19th and 20th reunions. Kamal A. Farooqui (KAF) briefed about a new established group by the name ‘HALQA E SHERO ADEB’ for those friends who are interested in Urdu literature and poems. KAF also introduced Syed Shabbar Hasan Abidi to the audience and praised his efforts in establishing the new group. Shabbar already arranged a successful mini program at his residence on 1st December 2018. The next program of newly established group will tentatively be held on February 02, 2019. Due to increased market prices, SAEEA can arrange two programs in a year. KAF requested audience to have their views in increasing the number from two and arrange three programs in a year. The results will be discussed in next SAEEA monthly meeting. Mrs. Qamar Khan, SAEEA Ladies Representatives spends most of her time out of Pakistan. So, there was a dire need having one additional Ladies Rep. Therefore, one new lady, Mrs. Sajida managed to act as Ladies Representative and her services were greatly appreciated by the audience. SAEEA had also two guest visitors of Iqbal Khan from the neighbor country. Several prizes were distributed amongst the audience thru lucky draw. Kamal thanked all Friends and families for their hands in making the 20th reunion a SUCCESS. The program concluded at 6:30 PM after getting several group and individual photographs.